Metrowax Records takes a serious approach to vinyl grading, and we base our grading system on the Goldmine Standard for vinyl record grading. Our vinyl grading goals are simple: We want to be as detailed and conservative as possible, so that you are happy with your purchase from us. We use an interpretation of the Goldmine Standard to grade each and every record that we list for sale. Metrowax checks for scuffs, scratches, warps, skips, stickers, writing and all other defects on the vinyl and the cover. A grade is given to both, and any notables are listed in comments. 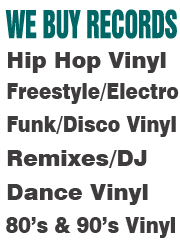 Records are strictly graded by the standards below and are guaranteed to be in the condition described. Mint (M) - A record that has never been played and is perfect in every way. Any still sealed record is graded mint. Mint grades are seldom given by us. Near Mint (M-) - A record that has not been used, or shows very little evidence of use. A near mint record may have one or two minor scratches or marks that are only found if examined closely. The vinyl will appear clean and glossy, and will typically have been played only once or twice. Excellent (EX) - A record that shows a few minor signs of use. Excellent grade vinyl typically has a few minor scratches or marks that can be seen on the surface. The vinyl appears mostly clean and glossy, though it does show a little minor wear and tear. For many rare titles, excellent is the highest grade available in the marketplace. Count on typically outstanding sound quality from the excellent grade, and look for minimal, if any, audible clicks or pops. 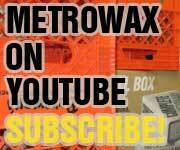 NOTE: The excellent grade used by Metrowax equates to other sellers VG+ or VG++ grades. Very Good (VG) - A record that shows moderate signs of use, and has been played many times, but not abused. A very good grade vinyl will have multiple scratches and scuffs all over the surface, but no severe marks. Very good copies have been used a lot already, but they have plenty of life left. Record playback will be of decent quality overall, mostly quite good, but may crackle, pop or hiss in spots. Audible problems will not recur continuously and will not be so distracting that they are louder than the music. Good (G) - A record that shows moderate to heavy signs of use, yet still is playable. Vinyl that has a grade of good will have numerous scratches and scuffs, some severe, and they will appear all over the record without much examination. Good copies have been used and maybe even abused a little. Audible pops and crackling is likely, perhaps some background noise, but overall, the copy is still listenable and playable in most cases. Good records should not skip and should play all the way through, despite a few audible problems. Fair (F) - A record that shows multiple signs of heavy use and abuse. Fair is the lowest grade we sell (the only lower grade would be poor). Look for multiple scratches and scuffs, many severe, appearing all over the record without examination. Fair copies will have background noise with crackling, popping and hissing and other problems. Still should play through most parts OK, and should not skip too often. A filler copy until you can find a better one. Mint (M) - No visible wear on the cover or corners. The cover appears to be new. The mint grade would only used for brand new items, and even a sealed item will have to be particularly sharp to achieve this grade. Near Mint (M-) - A cover that appears nearly new, with very little, if any minor wear. A near mint cover will be sharp and clean, glossy, be free of creases and ring wear, and will have really light, if any, corner and edge wear. Normal shelf wear would likely knock the cover down from the near mint grade. This grade is not often given to our used covers, since most covers will have at least little box and/or shelf wear. Excellent (EX) - A cover that has been used and handled some, but overall in decent shape. Excellent covers may have slight corner, edge and ring wear, and may be a little discolored from wear or dirt. The cover could have minor creases and marks, and normal shelf and/or box wear. Any defects seen will be relatively minor. Very Good (VG) - A cover that has been frequently handled and used quite a bit, but still shows mostly normal wear and tear. A very good cover is still good for protection of the record in most cases. Shows moderate corner, edge and ring wear, and may be creased, softened, or discolored from wear or dirt. Very good covers could have minor splits and/or water damage, if noted in comments. Good (G) - A cover that shows heavy wear and evidence of handling. Covers graded good will have significant wear on the corners and edges, significant ring wear, and may be heavily creased, soiled, water damaged, or split. Good covers are not usually very attractive, but still intact and should suffice for holding the record. Fair (F) - A cover that is falling apart and shows very heavy use and abuse. The corners and edges of a fair cover will be well worn and rounded. The cover will most likely be heavily worn and tattered, and no longer good for protection. Expect heavy creases, ring wear, water damage, and severe cover splits under this grade. It's basically falling apart at this point. Factory Sleeve - A die-cut sleeve with logo or graphics pertaining to the record label that released the record. Generic Sleeve - A plain black or white die-cut sleeve with no markings. Original Sticker Sleeve - A die-cut sleeve that has a sticker with artist and track information. Picture Cover - A Picture cover is usually a full color 12 inch by 12 inch cover. If a record is listed with a Generic Sleeve, it means we do not have the original cover for the item. We may send you lightly used generic sleeves as opposed to brand new. Wrong sleeves will not be sent. Any used generic sleeves that we send out will be fairly clean. There are a few types of non conforming sleeves. Plastic sleeves will be noted in comments, but also as original sticker sleeves or factory sleeves in the cover type designation. Gatefold promo covers (not picture) are noted as original sticker sleeves, or factory sleeves. Die-cut picture covers are noted as DIE CUT PC in comments, and the cover type will usually be picture cover. Some covers look like original sticker sleeves, yet they are not affixed with a sticker. These are usually noted as factory sleeves. Any other unusual sleeve will be described in the comments or item description. CC (Cut Corner) - One corner of the record's cover is cut off. This is done to promotional items by the manufacturer. CO (Cutout) - Used when a notch is cut out of the cover. This is done to promotional items by the manufacturer. CS (Cover Split) - Used when at least one side of the cover has split open. CWD (Cover Water Damage) - Used when there is evidence of water damage that has affected the cover. These covers are often defaced, where a section of the cover has been torn off. Covers with CWD also will appear wavy; not flat and straight. Sometimes these covers will have mold on them. GOLD PS (Gold Promotional Stamp) - The cover is stamped "promotional copy" in gold ink on the front or back cover. This is done to promotional items by the manufacturer. The record inside is not always a promotional copy; sometimes though the cover is promo stamped, the record inside will be the same as the normal release. HP (Hole Punch) - Used when a hole has been punched through the cover. This is done to promotional items by the manufacturer. 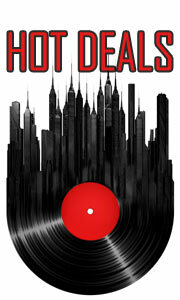 LS (Label Stamped) - The record label is ink stamped as a promotional item or with a DJ's mark. LTD ED (Limited Edition) - Used to note a record that is a Limited Edition pressing. LWD (Label Water Damaged) - Used when there is evidence of water damage on the label. Usually shows up as a water stain, sometimes mold. OBC (On Back Cover) - Used to note various comments that are on the back cover. OFC (On Front Cover) - Used to note various comments that are on the front cover. OG (Original Pressing) - Used only when repressed and/or reissued copies are evident. This notes that the item for sale is an original pressing. PS (Promotional Stamp) - The cover is ink stamped as a promotional item from the manufacturer. RW (Ring Wear) - The cover shows evidence of ring wear. Ring wear will appear as a circular ring that surrounds the outside edge of the record inside. SS (Still Sealed) - Used when a record is still sealed in the original shrink wrap and never opened. SOC (Sticker On Cover) - Used when there are sticker(s) on the cover. SOL (Sticker On Label) - Used when there are sticker(s) present on the label of the record. TOC (Tape on Cover) - This is sometimes used when there is one or more pieces of tape on the cover. TP (Test Pressing) - Used when the item is a test pressing. 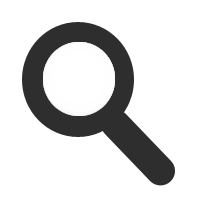 WL (White Label) - Used when there is very little or no track information on the label. Most are indeed white, but other color labels with sparse information are noted WL as well. WOC (Writing On Cover) - Used when there is writing on the cover. WOL (Writing On Label) - Used when there is writing on the record label. Is the defect hardly noticeable, or is it easily noticed and relatively severe? Are we talking about wear that's not severe, or is the item heavily worn? Most folks would not consider minor to be a problem. Major means it's easily seen and would likely be a problem if you didn't know about it first. If you compare a slight warp to a severe warp, there's a big difference. A severe warp would prevent it from playing, whereas a slight warp might be tolerable. AUTOGRAPHED - The record is autographed on the label, cover, or inner sleeve. BLACKED OUT LABEL - Back in the day, DJs used to completely black out the labels of some records with a pen or marker, so that nobody saw what music they were using. We can usually identify them by using the inscription on the inner vinyl. COLORED WAX - Used when the wax is colored differently from the normal run of the mill black vinyl. CORNER CREASED - A corner on the cover is clearly creased / bent. CORNER SMASHED - A corner on the cover appears pushed in, as if it were smashed. A smashed corner looks wrinkled, and will appear slightly rounded. CORNERS WORN - The cover corners appear rounded and worn. COVER DEFACED - This is used when an area of the cover has been torn completely off, exposing the white cardboard underneath. It could be associated with cover water damage, or a sticker that was torn off. COVER EDGE WORN - Used to note unusual wear on the cover edge. Cover edges can become worn by handling, moving and storing records on shelves, in boxes, or in crates. COVER STAINED - The cover shows a stained area. It's usually a result of water damage, but it could be something else. COVER STAMPED - The cover is stamped with ink. It could be a promotional stamp, or a DJs marking. COVER TORN - The cover is torn or ripped. COVER VG-EX - Sometimes used when the cover is in between two grades. COVER YELLOWED - The cover appears yellowed, not as white as it could be. This could result from smoke damage or aging in general. CREASES - The cover has some creases, though none are really severe. DIE CUT PC - A picture cover with a die cut center hole. DJ CUE STICKERS - If a sticker is on the label itself, it's noted as SOL. If a sticker is actually ON a track on the vinyl, it's noted as a DJ CUE STICKER. This will prevent play of one or more tracks on the record! F/W PRESSING - Seldom used. Nu Groove and some other original pressings are known to have the F/W inscribed on the label. GATEFOLD - This type of cover folds open like a book, with different artwork on the inside cover. HEAVY PRESSING - The vinyl is pressed unusually thick and it is a heavier pressing. HOLE IN LABEL - Some promotional items have a very small hole drilled in the record itself, on the label. LABEL BUBBLING - An uncommon defect that shows up when two label stickers were applied to one side of the record label. Over time, the top sticker will take on a bubbly appearance. LABEL DEFACED - This is used when an area of the label has been torn away. Usually results from removal of a sticker. LABEL STAINED - The label shows a stain. It's usually a result of water damage, but it could be something else. LABEL YELLOWED - The label appears yellowed, not as white as it could be. This could result from smoke damage or aging in general. LARGE TAPE ON COVER - A really large piece of tape on the cover. Any item that says this in our listings has an unsightly, large piece of tape on the cover, which is also written on in black marker for identification. LIKE NEW - The item for sale is in like new condition. LOW END EX - The vinyl is graded high enough to be an EX copy, but it's a bit shaky. There's a few more scratches and marks on it than are on our average EX vinyl. LOW END VG - The vinyl looks worse than a typical VG grade. Will most often be play tested, and it would not be graded VG unless it played solidly. Likely used for a record that is GOOD to VG, that also plays at least VG. MARBLED WAX - Used when the wax is a marbled design of two or more colors. MARRED - The vinyl or the cover is marred, which is a little worse than your typical scuff, scratch, or other damage. If a vinyl is marred, we'll play test it prior to listing. MOLD DAMAGE - The cover or label is stained and has clear evidence of mold. Usually accompanies water damage. NEAR EX - The record or cover is graded VG, but it's very close to EX. There's some doubt as to whether it should be graded at EX instead, but enough is seen to disqualify an EX grade. NICE COPY - The vinyl and the cover are in particularly nice condition given the age and/or rarity of the release. This is usually used on older pressings that are in exceptional condition, or items that are typically hard to find in decent condition. NOISE AT BEGINNING - Upon play testing, background noise was evident at the beginning of the record, but once the music really kicked in, the noise subsided and the record was quite listenable. NOISY - This is used when the item was play tested, and background noise was evident throughout. ONE SIDE IS EX - For a record lower than EX grade on one side, and EX on the other side. Only used if one side is clearly better than the other side. Also used on 2x12 sets when one side differs from the rest. PLAYS BETTER THAN IT LOOKS - Used in some cases to state that the item plays well, despite the fact it looks to be graded lower. PLAYS EX - Though the record appears as VG or worse, it plays as an EX record would play. Though it looks VG with some light scratches, it plays better than you would expect just by looking at it. PLAYS M- - Though the record appears as EX or worse, it plays as a NEAR MINT record would play. PLAYS OK - This one isn't used very much, because most of our records play just fine. This would be used in conjunction with another defect, such as a severe looking scratch that still plays OK, or a pressing defect that plays just fine. There are times when even the most ominous looking scratch will play as if it were not there. PLAYS VG - Though the record appears as GOOD or possibly FAIR, it plays as a VG record would play. Though it looks rough, it plays better than you would expect just by looking at it. POOR LABEL PRINTING - The ink on the record label is double stamped or otherwise of very poor quality. PRESSING DEFECT - The vinyl has been pressed in a defective fashion. Any such defect would be play tested and described. PRESSING FLAW - The vinyl has a pressing flaw, which may be a piece of dirt or debris that's pressed into the vinyl at the factory. Flawed items will be play tested by Metrowax before they are listed for sale. Small pressing flaws usually do not cause issues with playability. PROMO - This word is used in the comments when the release is a known promotional item. REISSUE - Used to note a known reissue. REPRESSING - Used to note a known repressing. SCUFFED - Used when either the cover or vinyl appear scuffed. This is typically more severe than a scratch. SEALED - The item is sealed, never opened, and in the original shrink wrap. SHRINK - The cover still has the original shrink wrap from the factory on it, though it is not sealed. SKIPS - One or more tracks skip on the record being sold. SLIGHT WARP - The vinyl has a slight warp. No tracks will skip and it will most likely be 100% playable, but the record will not lay completely flat, which is easily seen from the side while it's spinning. SOL RESIDUE - A sticker once affixed to the record label was removed, leaving behind a sticky residue. Even if it's cleaned off, it will usually leave a spot, especially if the label is white. SPINDLE MARKS - Spindle marks on the record label that usually appear on records that were used by DJs. The label around the center hole can become scratched by the turntable's spindle. SPINE WORN - The spine on the left side of the cover is worn, and possibly worn through. Spine wear can make it hard to see the title information that's typically on the cover's spine. STRONG EX WAX - The vinyl is graded EX, but it is a little better than most EX copies. A STRONG EX vinyl would have minimal evidence of wear, but enough can be seen that it is still not NEAR MINT. STRONG VG WAX - The vinyl is graded VG, but it is a little better than most VG copies. TAPE ON COVER - There's one or more pieces of tape on the cover. Tape will be on covers mainly to tape up the cover's split edges, but it can also be written on for labeling purposes. TAPE ON LABEL - The record label has one or more pieces of tape on it. We see this as a little less attractive than a sticker on the label. UGLY SCRATCH - Used when there is a highly visible and severe looking scratch. These will be play tested and if there's any effect on the play, we'll tell you! UNPLAYED - Used only when it is obvious that the item has never been played. VERY SLIGHT WARP - The vinyl has a VERY slight warp that was not easily seen. The vinyl will be 100% playable, but the record will not lay completely flat, which is seen from the side while it's spinning, but it's not that noticeable. VINYL VG-EX - Sometimes used when the vinyl is in between two grades. W/B&W PICTURE - The record comes with a black and white picture or photograph, usually of the artist or music group. These photos are usually promotional items. W/BOOKLET - The record comes with the original book or booklet that came with it as new. W/COLOR PICTURE - The record comes with a color picture or photograph, usually of the artist or music group. These photos are usually promotional items. W/INFO SHEET - The record comes with a printed sheet of paper with information on it pertaining to the artist, release, album, and others. Usually included with promotional releases. W/INNER - The record comes with the original inner sleeve (but not a picture inner sleeve). W/LOOSE SHRINK - The cover still has the original shrink wrap, but it is very loose and close to falling off. W/LYRIC SHEET - The record comes with the original lyrics sheet that came with the record. W/ORIG INNER - The record comes with the original paper inner sleeve that came with the record. It would only be noted if it were something other than a generic, plain white sleeve. Sometimes these have the record company logo or advertising on them. W/PIC INNER - The record comes with the original picture inner sleeve that came with the record. W/SPLIT INNER - The record comes with the original inner sleeve that is split open on one or more sides. W/STICKER - The item comes with a sticker, usually of the artist or music group. Stickers are usually promotional item, but not always. W/TORN SHRINK - The cover still has the original shrink wrap, but parts of it are torn. W/VG INNER - The record comes with the original inner sleeve that is graded about VG. WARPED - The vinyl is significantly warped. These items will be play tested and the details will be listed in comments.